Back again due to popular request (ie to satisfy my own curiosity) the annual list of the top five most-read posts on Invisible Paris. Come back next week for a list of my 5 personal favourite posts this year (which strangely enough – like last year – bears no resemblance to the list of most read articles). Keeping with tradition, I have also added a few notes for each post to explain why I chose the subject, why I think it worked and how the story developed. I was also happy to note that reader numbers for the articles were a good percentage higher than the top 5 from last year. If my output is declining, I’m glad to see that my audience remains interested in what I do manage to produce! Finally, thanks once again for visiting the site and reading the posts…and bonnes fêtes! 5. Life Begins at 40: Has the Olympiades Development Reached Maturity? Whenever possible (or whenever I have time or think about it), I try to link posts on the blog with current events. This anniversary, celebrated at the excellent Pavillon d’Arsenal (although curiously with a less than inspiring exhibition for this particular event), seemed an excellent opportunity to look back on a form of architecture and large-scale development that went out of fashion as quickly as it arrived. It remains mostly unpopular, but has it been such a failure? This development suggests otherwise. The Tour Montparnasse also celebrated its 40th birthday this year, as did parts of the Front de Seine development. With high-rise blocks looking to make a comeback to the Paris skyline shortly (albeit on the city’s periphery), has the tide turned back towards the vertical? Such developments will always remain controversial in Paris, but I still enjoy wandering around these areas – which make a fascinating contrast from Haussmannian conservatism and offer excellent opportunites for photography. 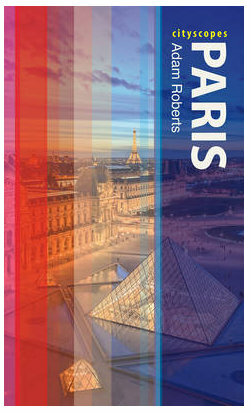 Like most Paris bloggers (I imagine), I often receive requests to promote books, applications, tours and websites. Most I refuse after taking the executive decision that it won’t interest you, my reader. However, occasionally I do get requests that I am only too glad to support, and Patrice Rambaud’s 'L'œil du pigeon' series of books are an excellent example. This was not simply a request to help sell books though, but rather to help their creation. Patrice was looking for funding to complete the full set of arrondissements after having drawn a prototype book for the city’s 20th district, and I’m glad to report that he did meet his target. The books are beautiful objects, bringing to life the soul of the city with just a few thin black lines and one splash of colour per arrondissement. I look forward to seeing the next editions in 2014. For some reason, an empty building in Paris became something of social media star this summer, despite having been stood in the city for over 30 years (and mentioned that long ago in a book by Umberto Eco). When I read about such stories, I always want to find out more, and it seemed certain that this building could not be unique in Paris. Finding another couple of ‘fake’ buildings was not difficult, and I’m sure there are plenty more dotted around the city. We are all interested in these little hidden and mysterious parts of our city – so it is not a surprise to find this article high up the list - even if in these particular cases the reality of their purpose is not particularly an exciting one. It was something of a surprise to find this article so high up my annual list. I am often on the periphery of this town, but begin to feel distinctly uncomfortable whenever I wander inside its limits. This article stems from my desire to find out why the town puts me on edge, and what makes it different from other towns around Paris. The answer stems from the town’s history and how its historic divisions are still reflected in today’s layout. I also found though a town that has known revolution and was once on the firing line of a bloody battle. However, if I better understand how the town works now I’m still reluctant to spend much time wandering around its arteries. There was also - later in the year - an interesting footnote in the comments. Neuilly may be an uninspiring place today, but it has welcomed many interesting personalities, all of whom have their stories to tell. I am very happy that this article arrived in top spot as it is exactly the kind of story I most like working on. As with several other articles that I have published on this blog (see here and in next week’s favourite posts), the initial spark came from a vintage postcard I found at a fair. Amongst the thousands of pictures of Paris monuments, I occasionally come across pictures that make me stop and think. My goal is then to find the story behind the picture, without knowing exactly where this mission will take me. What was particularly pleasing this time was that it took me on a voyage across time almost up to the present day, and that it sparked memories for my readers. I'm not sure I solved the mystery of the postcard, but it did at least lead to a good story. The next Cartexpo show - where I find most of these cards - will be held on January 10th and 11th at the Espace Champerret. I hope to find inspiration there for a few more posts and stories in 2014!